It’s now the end of November and I’m still knee deep in Pumpkin scents and guess what? I’m not going crazy… I’m actually quite enjoying myself, especially when the scent is so yummy, you’re actually tempted to eat the darn thing. That was me with Bourbon Pumpkin Cake from Madison Valley. It smelled so delicious and edible, I couldn’t stop sniffing it. The wax smelled like creamy pumpkin and cake along with sugared pralines and heaps of brown sugar – or something close to it. It smelled positively yummy!! A perfect blend of Kentucky Bourbon, Pumpkin, French Caramel, Brown Sugar and a finish of pure cinnamon. This is sure to make your holidays smell delicious. Mmm! This was a very different sort of bakery. I smelled a delicious cake as the base with brown sugar and what I’m guessing was the bourbon along with sweet pumpkin. There was a sharpness to part of the scent that kind of did smell like alcohol. That had to be the Kentucky Bourbon. The caramel and brown sugar was there as well giving this scent a perfect bakery sweetness and warmth. The overall aroma reminded me of a rich and creamy pumpkin tiramisu if there is such a thing. Cinnamon? My nose wasn’t picking up on much cinnamon and I was perfectly okay with that. Pumpkin Tiramisu. That’s what Madison Valley should call this one. 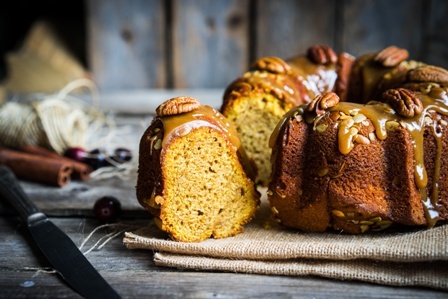 Have to add – my youngest son loved Bourbon Pumpkin Cake too. He came out of my bedroom the second night I had it burning and let me know he loved the aroma. He said it smelled like an Italian pastry he wanted to eat. It made him hungry. Me too!! That’s the best kind of bakery isn’t it? If you’re tempted to eat it, you know it smells pretty realistic. Strength – I would rate Bourbon Pumpkin Cake a 7 out of 10 in a really large room. 10 in medium to smaller rooms. Not bad for an all soy candle. How did my Bourbon Pumpkin Cake candle burn? This candle burned great. I did have to stay on top of wick trimming throughout the day or the flames would get really huge. A very important reminder to always watch your burning candles. Bourbon Pumpkin Cake was a delicious bakery scent I enjoyed from start to finish. I wouldn’t consider this a Fall scent although I know it is. 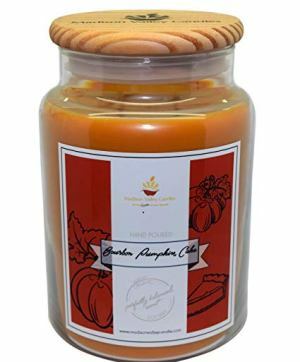 Personally, I think it’s a perfect bakery scent to burn all year long if you love sweet pumpkin blends. I enjoyed Bourbon Pumpkin Cake and would for sure purchase it again. Giveaway time!! Madison Valley is giving away a wonderful gift basket to one lucky Candlefind winner just in time for Christmas! It’s worth close to $100.00 and will be filled with all their new fall and winter scents. SO AWESOME!! Check out our Facebook page for details on how to enter. This is really kind of you to do. All I want for Christmas is to join the 21st century and get a smart phone, because my flip phonedoesn’t work anymore. Hi – I’m not on Facebook, is there another way to enter the Madison Valley gift basket contest? So go ahead and submit your entry here and I’ll get it posted.